These cute cubes light up in the water and turn off when it drains, so kids will enjoy longer tub times. Rub-a-dub-dub, eight pals in a tub, and what do you think they do? When they get wet, they get cooler yet, 'cause then they light up, woo hoo! 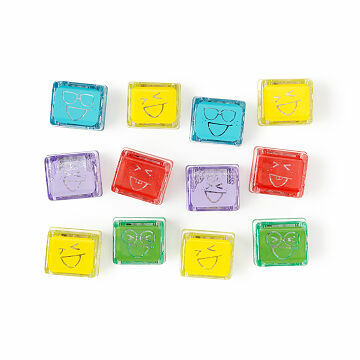 Kiddos won't want to leave the tub when these liquid-activated toy cubes are a-glow. There are two different faces and personality types in each set of eight. When placed in liquid, they each glow and project onto the surroundings— just wait til you try them in the dark! When it's time to get out, simply drain the tub: They turn off automatically, signaling that bath time is over. Cubes light up for a minimum of eight hours total. Made in China. Store in a dry location for longer battery life. Each Bath Buddy lasts a minimum of 8 lighted hours when activated with water. Each Bath Buddy is hermetically sealed for child safety and to ensure waterproof usage. When the battery life ends, please recycle the buddies. My son absolutely loves these! I bought them for his fourth birthday last week and he hasn't taken a bath without them since. He absolutely loves turning the light off in the bathroom and playing with these lights in the tub. Perfect toy to stimulate creativity AND learning!!! My boys love playing with these in the bath, and the older is really into STEM so he was thrilled to get to figure out how these work! I even like to drop one into the tub when I'm taking a relaxing soak at night! Our 16 month old loves them! Fun in the bath tub! The bath toys seemed durable and well built, which is important in any toy. I was shocked at how small they were. I had envisioned blocked the girls could play with in the tub, but really these could only be used as lights. My nieces loved having colored lights in the tub, so overall a win! My daughter is almost five and has outgrown most bath toys. These cubes are fun, interactive, and can be played with in so many ways! We love them. I bought these (2 packs, one yellow and one green) for my 18 month old son and they really are fun to use at bathtime! However, we've had them for less than a month and already only half of them work. We used them almost daily but for about 10-15 min and then dry them off after bathtime. The glo pals website says they should last 8 hours and we're not there yet. I'm so disappointed. For the cost, that's ridiculous and you can't replace the battery. These were a big hit with all of the grandkids! The only complaint was that the parents couldn't get the kids out of the tub! Bath time-favorite time of the day for one of my grand-daughters. She will stay in the tub as long as the water is warm and she loves her glowing bath time pals.